This 40 acre property with hunting cabin is located in Van Buren County, Iowa. 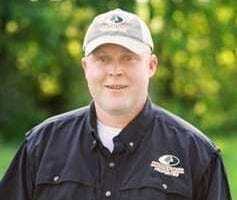 Finding a smaller property with enough of the right attributes to make a great hunting farm can be very difficult. This property really seems to have it all – the mix of habitat, food sources, ample water, and seclusion. It also features a very nice 2 bedroom cabin with incredible views.